There’s a month to go until The Secret Garden of Stories, The Reader Organisation’s first ever Children’s Literature Festival gets underway – we can’t wait to share lots of stories, create some brilliant bookish crafts, play games and have lots more fun. Entry to the Secret Garden at Calderstones Mansion House is just £1 for a whole day of fun for all the family. As well as having lots of wonderful stuff to do we’ll also be opening the Author’s Den, giving the chance to say hello to some of the best authors in children’s literature and hear them share their stories especially for The Secret Garden of Stories audience. The Author’s Den will be open each day during the festival with appearances from four brilliant writers. After a twenty year career teaching children and teenagers, Jon Mayhew decided to indulge his passion for writing and storytelling. His dark imagination comes through in his debut novel Mortlock, a ‘gruesomely gothic middle-grade chiller’ set in Victorian London and following the journey of orphan Josie as she, along with her newly discovered twin, aim to defeat the growing powers of the evil Lord Corvis and seek the legendary Amarant – a plant that has the power to control life and death. Mortlock was shortlisted for the Waterstones Children’s Book Prize 2011 and longlisted for the 2011 Branford Boase Award, an award given annually to the most promising book aimed at seven year olds and up by a first-time novelist. Jon has gone on to write books such as Monster Odyssey: The Eye of Neptune, The Bonehill Curse and The Demon Collector, and continues to teach, now specialising working with children with autism. As well as writing, he is also a keen musician – playing in folk and ceilidh bands – and enjoys running. He lives on the Wirral Peninsula – a place that with its mists and marshes likely gives lots of inspiration for his spooky novels – and looks after a menagerie of animals with his wife and four children. Lydia Monks is a writer and illustrator who hails from Surrey but grew up in Northampton, spending a lot of time drawing horses. After wanting to pursue a career in fashion design but finding that she wasn’t great at sewing, she decided to go back to her childhood talent of drawing. Lydia worked for a number of different newspapers and magazines, including The Times and The Evening Standard, but illustrating children’s books was the thing she really wanted to. 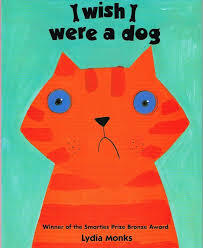 When she couldn’t find an author to illustrate for, she wrote her own children’s book I Wish I Were a Dog, the tale of Kitty the cat who decides that she would much rather be a dog. The book won the Bronze Award in the Nestle Smarties Prize in 1999. She has wrote and illustrated other books known for their colourful and quirky style, including Babbit, Aaarrggh Spider! and Mungo Monkey, and has worked alongside countless other authors including Julia Donaldson, Ella Richardson and Roger McGough by creating illustrations for their stories, including the multi-award winning What the Ladybird Heard. She has another particular talent for dancing, attending tango classes and winning medals and trophies for Irish dancing. She doesn’t have any pets but always talks to cats in the street, and her sister is also a children’s book illustrator.